There are two one bedroom apartments on the ground floor, one with twin beds and the other with a double bed. Both have balconies with table and chairs. In addition, they each have a terrace with sea view on the second floor. There is a spare bed in the sitting room. 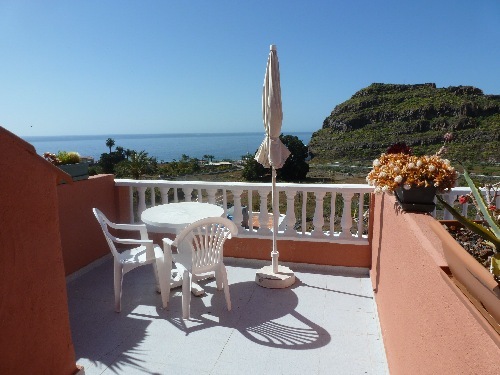 Our two partial sea view apartments have balconies and two bedrooms. One with double bed and the other with twin beds, although we are happy to rent outwith just one bedroom for 2 people. This is where the best views are and the biggest terraceswith sun loungers, table, chairs and shaded area. We have studios, one bedroom and two bedroom apartments on these two floors. Very popular in the winter months with sun seekers from further north, it is adviseable to book early. Press 'more' to see the apartments in detail.